Fall is my favorite time of year for a variety of reasons– the brilliant colors of the changing leaves, the cooler temperatures, and of course for the abundance of foods that are prevalent this time of year: squash, pumpkins, apples, parsnips, Brussels sprouts– love them all. I also love nothing more on a cool fall day than a nice hot bowl of soup. When I went apple picking two weekends ago I also picked up a beautiful butternut squash at the same farm and this inspired me to whip up my first soup (chili doesn’t count!) of the season. This recipe starts with roasting cubed squash for a nice caramelized flavor. 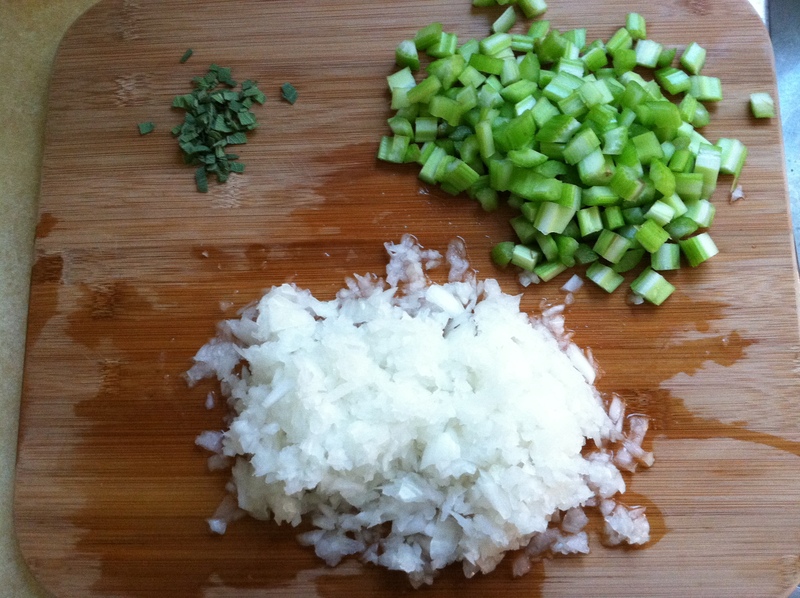 Then you chop up some onions, celery and fresh sage. Sage is a wonderful herb that does a lot of work this time of year as it pairs very nicely with squash and pumpkin as well as poultry. Bonus: it makes your house smell wonderful! After these ingredients (along with some vegetable or chicken broth) had simmered for a solid half hour I busted out my immersion blender and made a beautiful smooth soup. What goes well with soup? Bread. What’s one step better than bread? 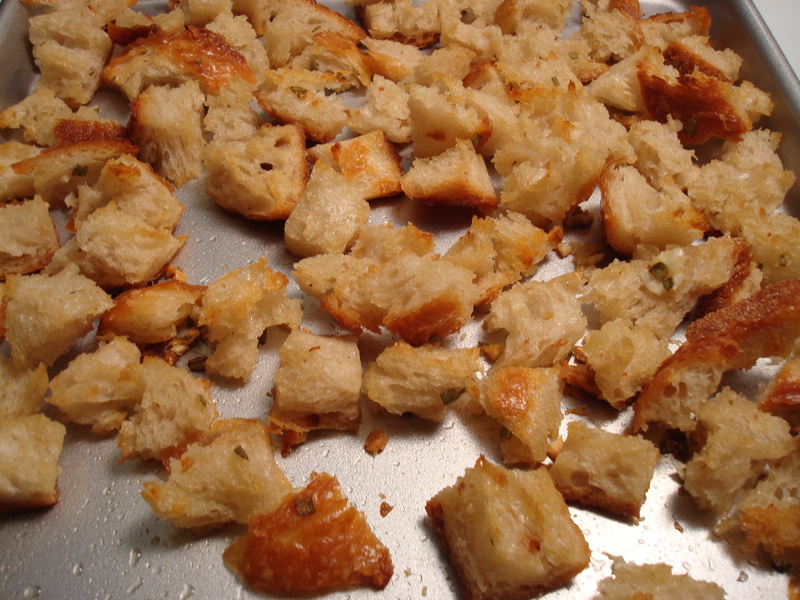 Homemade croutons. I chunked up a few slices of sourdough bread and tossed them with olive oil, more chopped fresh sage, minced garlic, finely shredded Parmesan and a little salt and toasted them in the oven until they were nice and crisp. Preheat oven to 400° F. In a large bowl, toss the squash with 2 tablespoons of the olive oil, 2 teaspoons of the salt, and the pepper. 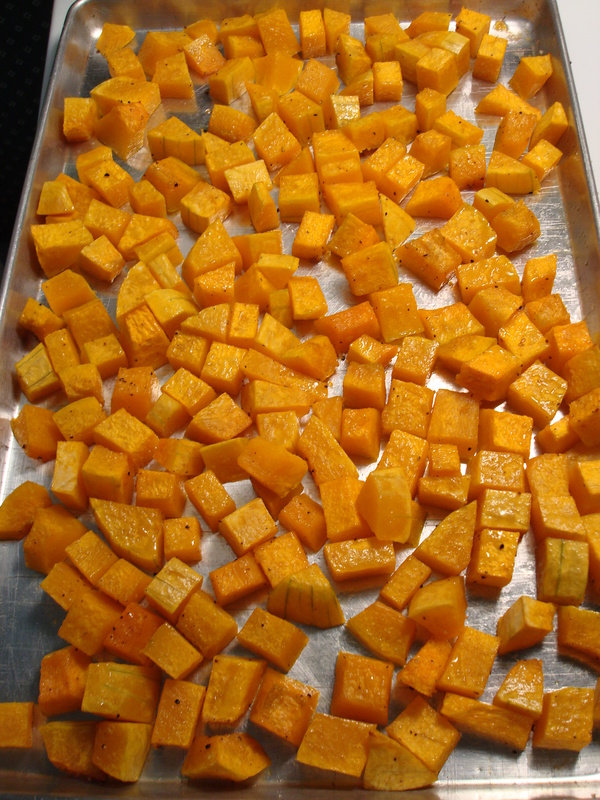 Place the squash on a rimmed baking sheet and roast in oven for 15 minutes. Turn the cubes over and continue roasting for 15 minutes or until they are caramelized; set aside. salt and bring to a boil. Lower heat and simmer for 30 minutes or until the liquid is flavorful. Remove from heat. 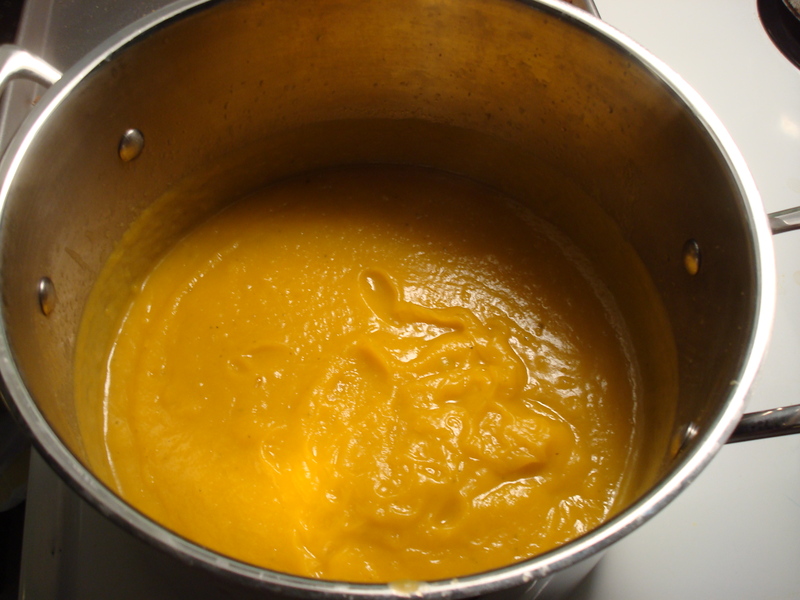 Using a blender or a food processor, blend the soup in batches until smooth. Return to the pot and keep warm. Top with Sage and Parmesan Croutons and the grated Parmesan. Preheat oven to 375 degrees. Toss all the ingredients together in a mixing bowl to coat. Spread the bread evenly on a baking sheet and toast in oven for 10 to 12 minutes or until crisp and golden brown. 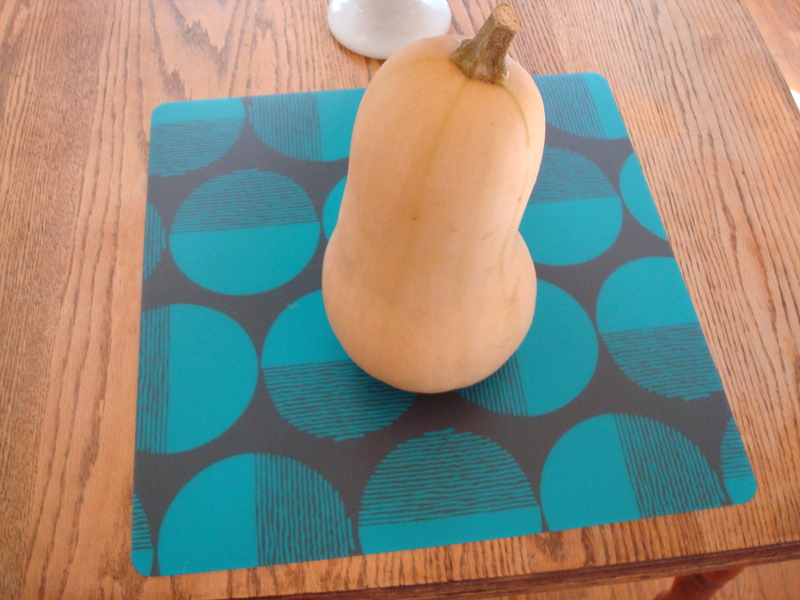 Bought my butternut last weekend at the farmer market. Thanks for the recipe…I love sage. Fresh from my balcony. Diced pear sounds like a great addition! 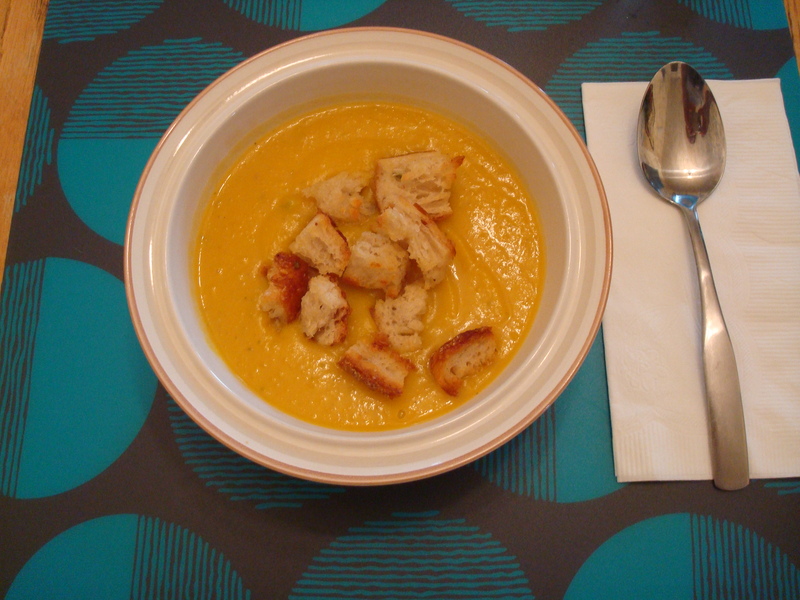 I’ve had butternut squash soup with apple in it and loved it but pear sounds even better. Definitely looking forward to the pickled watermelon rind too!!! And I fully support you pickling baby beets in the future. A coworker of mine does and gave me two jars for my birthday– best gift ever.